Obviously the list of opportunities below are not exhaustive, I'm sure there are plenty I've missed. These are just things that I personally have either tried, am currently doing or have come across in my own research. I'm not recommending any opportunity over another and don't think that, just because I've tried something that is the best option. Some of these I discovered in the course of writing this article so I have no real experience of how good an opportunity they are. It's beyond the scope of this article to go into specific details about each opportunity. Instead I've provided a summary and any relevant links. From there you should do your own investigation on whether a particular opportunity sounds right for you. Keep in mind that all of them require work and persistence in order to be successful. Exhibiting and selling your work in real world, bricks and mortar galleries (or even shops) could be limiting if you want to be truly mobile but say you travel to many places on a regular basis, getting your original work into places where buyers can physically experience it is not such a bad idea. The number one hinderance to selling art online is that people aren't able to experience the actual artwork. It's hard to understand the scale, texture, color and detail through a computer screen. Personally, the number one comment I get from buyers is that my art looks even better when seen in person. Getting your work into galleries can be a challenge. More than ever, you need to research potential galleries to see if the work they sell is similar to yours in theme and subject matter. Most galleries sell to a specific market so if they don't show interest in your work it may be that they feel your art doesn't fit their market. Ebay is one of the biggest markets online. If you can't find a market for your particular style of art there then finding a market anywhere is going to prove challenging. That said, people shopping on Ebay are looking for bargains. I don't know about you but the number one reason I look on Ebay for anything is to see if I can get what I want for a lower price than retail. If you're just starting out Ebay is a good way to attract interest in your art. Make sure you sell great examples of your work. Don't fall into the trap of thinking Ebay is where you sell your less successful pieces. I would recommend posting at least some artwork that you're happy to sell for a minimum price of about $49.95 (most people will impulse buy up to about $50.00). My own strategy was to list artworks for auction with an opening bid of $49.95 and a Buy now Price of just over double that. Once a bid is made the buy now price is gone. If you're lucky you'll get bidders fighting over your art to the point where they go over your buy now price. That said, a lot of my paintings were sold for $49.95 (keep that in the back of your mind. Don't list anything you're not happy to sell at your minimum price). When you make a sale use the opportunity to funnel your buyers to your website or wherever you sell your more ambitious and higher priced art. You may just encourage a sale, now that that buyer trusts you to deliver on their purchase. Ebay also has the option to open an online store on their site. If you make a lot of art and find you're getting consistent sales then you may want to consider a shop. Unike listing individual items where you pay listing fees and final value fees, stores also include monthly fees that you need to pay whether you sell anything or not. There are different levels of stores at varying prices. The main advantage is it's one way to give yourself that one location to direct all your potential buyers too. There are alternatives to Ebay stores. If you like the idea of selling your art through your own website FolioTwist is an artist webhosting service created by the makers of Empty Easel, the respected artist advice and showcase site. The tools they offer are geared entirely towards the needs of artists. If you want something that also comes complete with its own market place Etsy and Zibbet both offer online stores attached to their market place. Both sites are exclusively for hand made art so be sure to check that your art fits with their guidelines. Fine Art America also has options to sell original art and build a store into your own website that is worth looking into. 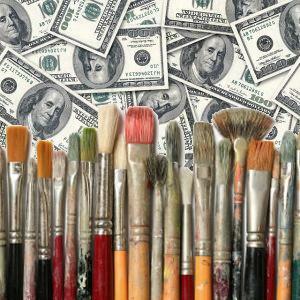 Accepting commissions is a popular way to make money from your art both offline and online. Once people start to get to know your art style it's almost inevitable that you will get people asking you to draw/paint/create their idea or concept in your artistic style. As an artist who does take on commission work from time to time I can tell you it can be a fun challenge to collaborate with clients to bring their ideas to life as an artwork. Usually clients will be familiar with your art and, most of the time, they've come to you because they've seen that you know how to create something similar to what they have in mind. Many times, for me, it's ended up with a finished artwork that I just wouldn't have come up with on my own and is often work that I'm most proud to show. Unlike your regular artwork, commissions have the added benefit of already having a buyer - which is a strong incentive to take on this kind of work. If you are considering this option, always make sure you ask for a non refundable 50% deposit up front. No matter how confident you are with your art there will be occasions where the client doesn't like the finished result and refuses to pay or just abandons the project with no explanation. Either way you want to be sure you at least get some pay for the work you did. Generally most jobs should go well and end with a happy client if you've consulted with them at every critical step and corrected any issues as they've come up. That said, make sure you receive full payment before delivering your art. The beauty of Print on Demand sites is that you can sell the same piece of art over and over again as framed prints or your art printed onto gift items etc. Some artists view this as selling out but it's really selling smarter. Nothing is stopping you from continuing to sell your original artwork. Selling prints or gift items is just another way for people to enjoy your art and you may get sales from people who otherwise can't afford to buy the original artwork. Of course if you're primarily a digital artist then Print on Demand sites are a great way to bring your art into the physical world. Many print on demand sites will allow you to create a shop through their website. I personally have a CafePress Shop (which costs nothing to set up - Prints, Clothing and Gifts) and a Redbubble Porfolio (which includes a shop section - Prints, Clothing and Gifts). I also have a BoardPusher shop (Skateboards) where I sell designs on Skateboard decks. There are many different print on demand sites with varying fees, shop fronts and even types of products you can create. One interesting site I discovered recently is Shapeways a service that will print out your 3D model designs in various materials including plastic and metals. Through the site you can open a free store selling your 3D objects (seemed popular with jewelry designers). A few other POD sites I've come across include; Fine Art America (Prints, Clothing and gifts), ImageKind (art prints), Zazzle (Clothing and gifts), Society6 (Prints, clothing and Gifts), Blurb (Books), Lulu (Books). If you want to add some exclusivity to your print on demand products you can limit the print run of each product (and make this clear to your buyers). Once you've sold a particular number of each item, remove it from your range - never to be sold again. By doing this you can justify charging higher prices than if you sold an unlimited number of prints but you should weigh the pros and cons. Would you make more money in the long term from an unlimited number or does exclusivity encourage more sales across your whole range if people know there will only be a limited number available? There are just so many opportunities to make money online from art that I couldn't fit them all into one post. Next time I'll continue on through my own list of opportunities, hopefully giving you some further options for getting your own online business up and running.